These terms and conditions apply between you, the User of this Website (including any sub-domains, unless expressly excluded by their own terms and conditions), and Two Chimps Coffee Limited, the owner and operator of this Website. Please read these terms and conditions carefully, as they affect your legal rights. Your agreement to comply with and be bound by these terms and conditions is deemed to occur upon your first use of the Website. If you do not agree to be bound by these terms and conditions, you should stop using the Website immediately. In these terms and conditions, User or Users means any third party that accesses the Website (but excludes our employees, consultants or suppliers acting in that capacity). You must not otherwise reproduce, modify, copy, distribute or use for commercial purposes any Content without the written permission of Two Chimps Coffee. This Website may contain links to other sites. Unless expressly stated, these sites are not under the control of Two Chimps Coffee or that of our affiliates. Any online facilities, tools, services or information that Two Chimps Coffee makes available through the Website (the Service) is provided “as is” and on an “as available” basis. We give no warranty that the Service will be free of defects and/or faults. To the maximum extent permitted by the law, we provide no warranties (express or implied) of fitness for a particular purpose, accuracy of information, compatibility or satisfactory quality. Two Chimps Coffee is under no obligation to update information on the Website. Whilst Two Chimps Coffee uses reasonable endeavours to ensure that the Website is secure and free of errors, viruses and other malware, we give no warranty or guarantee in that regard, and all Users take responsibility for their own security, that of their personal details and their computers. Two Chimps Coffee accepts no liability for any disruption or non-availability of the Website. Two Chimps Coffee reserves the right to alter, suspend or discontinue any part (or the whole of) the Website. This includes, but is not limited to, any products and/or services available. These terms and conditions shall continue to apply to any modified version of the Website unless it is expressly stated otherwise. The Contracts (Rights of Third Parties) Act 1999 shall not apply to these terms and conditions. No third party will have any right to enforce or rely on any provision of these terms and conditions. Unless agreed otherwise, no delay, act or omission by a party in exercising any right or remedy will be deemed a waiver of that, or any other, right or remedy. This Agreement is governed by and interpreted according to the law of England and Wales. All disputes arising under the Agreement (including non-contractual disputes or claims) shall be subject to the exclusive jurisdiction of the English and Welsh courts. Two Chimps Coffee Limited of 8b Oakham Enterprise Park, Ashwell Road, Rutland, LE15 7TU operates the Website www.twochimpscoffee.com. The registered VAT number is 248022817. You can contact Two Chimps Coffee by email on hello@twochimpscoffee.com. 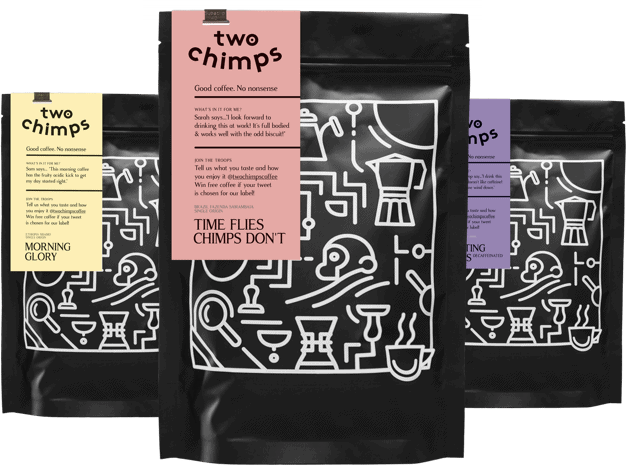 At present, Two Chimps Coffee Limited are only able to fulfil orders with a delivery address within the United Kingdom.